Click the button below to add the TS-RM-2 Morningstar Tristar Digital Remote Meter to your wish list. Morningstar’s TriStar Meter-2 (TS-M-2) and TriStar Remote Meter-2 (TS-RM-2) are advanced digital meters that may be used with any TriStar solar controller. These two meters are identical except that the TS-M-2 is mounted on the controller and the TS-RM-2 is flush mounted up to 30 meters (98.4 feet) away from the controller. Uses standard 6 conductor RJ-11 connectors. TS-RM-2 fits a “double gang” electrical box and includes 30 meters (98.4 feet) of cable. Both data and meterbus power flow over a single cable. Network supports up to 15 devices and, optionally, more than one meter per system. Four directional pushbuttons for easy navigation of display screens. Meter may be added during initial controller installation, added as an upgrade anytime in the future or connected temporarily for troubleshooting and then using this same meter at other sites. Displays individual controller data from up to 14 TriStars with optional Morningstar Meterhubs. Aggregates system data to show total charge, load and battery charge/discharge state. Auto detects any device found on the network. 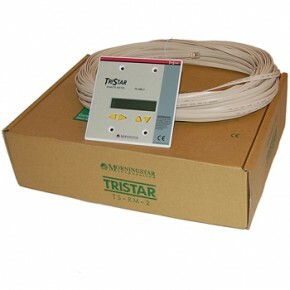 The meter will display a great deal of information about the TriStar controller and the operation of your system. In addition, the meter enables manual functions and controller diagnostics. These capabilities will increase your confidence that the system is working properly and will help you to improve system reliability, battery life, and system performance. It is worth the time getting to know your meter! The TriStar meters are 2 x 16 character LCD’s that display extensive system and controller information, logged data, bar graph metering as well as alarms and faults for easy troubleshooting. The information may be shown in English, French, German, Portuguese or Spanish languages. In multi-controller systems the TS-M-2 and TS-RM-2 are networkable using Morningstar’s MeterHub to allow individual controller data and aggregate system data to be displayed together on a single meter. Battery voltage, charge/load current, battery temperature, TriStar heatsink temperature, PWM duty cycle, PV/load voltage, and all TriStar alarms or faults. Battery voltage, Relay Driver temperature, input voltages from other sources. The four channels provide up to four high level system control functions at a lower cost compared to other alarm and generator start packages. Each channel has complete electronic protections for high reliability. The system designer may choose the exact relay needed for each application including a wide range of current ratings and solid state, mechanical or mercury displacement relays. It is easy to program the Relay Driver with the included PC software via serial RS-232 port connection. Data is stored in non-volatile memory. The Relay Driver is pre-programmed with four commonly used settings. Provides flexible parameters to control one, two or three-wire generator schemes and complete control of preheat, crank, ignition and cool-down. Each relay driver output may be controlled directly by MODBUS commands via the RS-232 for use with PLC’s and other industrial hardware. Mounts to a DIN rail or a flat surface. Displays power and status of each channel as well as faults and data sampling intervals.